rideTYRANT.com: TNT Trails After All? 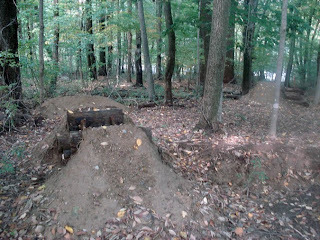 So the year is winding down, Fall is here, and I'm off the bike till 2010 some time...but it looks like the TNT Trails are still going to be built! My cousin just informed me his work schedule is slowing down and he is going to drop off his backhoe at 122 for some clearing and digging in the coming weeks. I'm pretty much useless in a cast, so I'll be navigating John through the woods and he'll be stacking some lips and landers which will be left to harden over the Winter for Spring carving and clean-up. 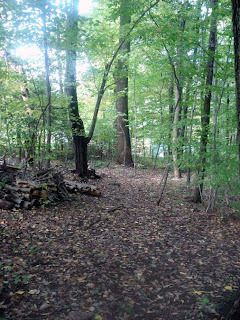 There will be a set of 4 pretty big table tops on the far left of the woods. This will be the line that the BMX, MTB, and cyclocross bikes can go through by jumping or rolling each jump...gotta keep everyone using the trail system happy. I figure there is no better way to celebrate the end of Winter and getting back on the bike than finally have the trails up and running by early Spring. If anybody is interested in slinging some dirt, raking, etc. contact me. The more work horses, the better. Pizza and beer, soda, water on the house!